for a typical Android user. Not too long ago, they intentionally stopped Airtel Bis 1+1 Offer given you 4GB for 1500.
in their words, they call it a promo, but in my words, I call it a temptation. 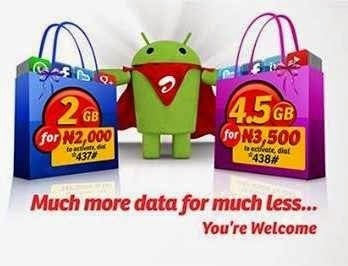 9GB for #3,500 to last you 2months. Who Should Go For This Plan? are eligible for this offer. What If I’m Not Eligible For This Offer? be erace if they truly want an headway with this plan. will you rock this offer? Airtel is really getting better. Nice post Yomi. Can it work on BB10? Prof, please i need 10 bb imei………. I may try this hmm 9gb is so tempting …..is there a solution for non MTK devices on changing imei yet ? Pls, can I have ur facebo0k link? Tanx. prof… my ROEHSOFTRAM Expander(SWAP) is writing an error dat my kernel does not av a swap compatible kernel. pls wat do i do? Did u just download it or you've been using it before? Prof, between g-slide and techno, which one is better? Both brands are cool just that one price is costlier than the other. The question is how much do you wana budget for a mobile phone? Nooooo, google won't ban you at all but you don't have to remove it naaa. Earning with adsense takes a little bit time but just patience. It took me 6months to earn my first 10dollars. I'll suggest you put it back and den forget about it on ur blog while you concentrate on affiliate program like Konga, it pays heavily. @your first question, it means you havn't install it or what? Secondly, make sure your imei is upto 15, then space ur At command like this "At +EMGR=1,7,"imei"
Pls prof how can I change my tecno p3 imei "Ginger bird 2.3"
Yes of cos, u can change ur imei using mobile uncle method. Pls send me the link and the exact steps involved because I can't see CDS in my P3 and besides my GLO BIS will expire on the 18 on this month and I haven't used it yet. Update your playstore to the current… if you can't update it, delete it and re-download the current version. this blog is great,see simplicity abeg! Wen d bloger replies evry questn askd,menh! Mr yomi ur d best,jus keep it up…10kx 4 d recent imei tweakn trick..
Good morning Mr yomi, pls I genarate new IMEI but I don't no how twet it, pls help me. On what device did you wana tweak it? Yoga Yomi, thanks for your constant updates and enlightenment as I've benefitted from u immensely. May God continue to upgrade u.
I don't have a computer system to generate IMEI number on my own. Can u kindly generate two for me please? My e-mail is [email protected]. There is no group as whatsapp group… Only telegram group but It seems I should create BBMChannel so that we all can relate on that better. When you insert an alien sim, did it display "enter an unlock code?" if no, then you need to get the latest version of Dcunlocker. it will unlock it for you. Why did you remove your sitemap? put it back and they will start indexing it. Is your site verified? submit it to google webmaster. No, only Glo bis at the moment. verify that you have the 100mb. then set your apn to etisalat. no password and username. Prof can i changer the imei of my samsung galaxy s gti9000 using the terminal emulator method? How old is ur infinix zero? If you didn't tweak it, and you got it from a reliable vendo, return it. You warranty is still valid instead of repairing it. Did u see cds information>> Radio information wen u try to tweak ur imei? yes prof, but the reply I received from it is supersu access denied, help me prof.
To change ur phone 2 imei just set ur AT comant to "At +EMGR=1,10,"imei"
Just go to google and download another one while u delete d current one. What methods have u tried? What did you press to get to ur recovery mode? Volume up plus power button should give u in English menu; while volume down + power down should give u in Chinese menu. Try it. If u still have d same challenge, then you'll need to get English recovery.img and flash it via sp flash to ur device. prof, my glo bis on android isnot bringing 3g. the internet is just to slow. i tweaked my 2nd sim imei with d imei u sent to my mail. wat accesspoint am i to use, cuz am usin backberry.net.. or is their anytin i can do to make my surfing faster? Pls prof kindly answer this four questions. Is tecno f6 a media tek phone. And can I change the imei without any issues. Give me the link of the exact method to use in changing it. Can I top-up my glo bis to accumulate the data when my bis have not expired? Pls tell me how to get this imei change using my local p3. Go and deactivate your window update from settings. That's what zapping your MB on airtel. Did Xiaomi Mi Mix 2s Just Copied iPhone X?